Since Candela introduced the VBeam, testimony to its effectiveness has mounted. SunrayLaser.com has an expertly refurbished VBeam perfectly suited to your practice in stock and ready to help your patients. Dermatologists agree that VBeam is the benchmark for pulsed dye laser technology. Its variable-width, eight micro-pulse beams can effectively treat an extraordinary range of pigmented skin conditions. Pulse dye laser treatment is gentle, non-invasive and suitable for use on the face, hands, chest, legs and neck. VBeam methodology involves cycling bursts of yellow light into lesions made red by blood vessels. The yellow light destroys the red cells, but avoids injuring surrounding tissue. The process is safe and produces minimal downtime. Patients report few side effects. 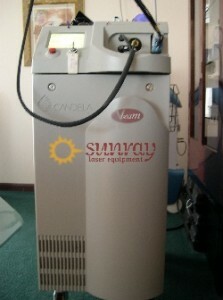 A refurbished VBeam from SunrayLaser.com features Candela’s exclusive Dynamic Cooling Device, or DCD. To offset the possible discomfort of the treatment, the DCD introduces a minute spray of cryogen fractions of a second prior to each burst of laser. This built-in epidermal cooling device not only maximizes a patient’s comfort during the procedure, but also reduces the risk of scabbing or blistering. Purchasing a used Candela VBeam from SunrayLaser.com could not be easier. Our skilled technicians have already reconditioned your device. It is ready to ship. Our position in the market for refurbished Candela VBeams enables us to quote a great price for equipment in such steady demand. We are proud of the savings we can pass along to our customers. To find out if a used Candela VBeam is a good fit for your practice, please contact us. We are easy to reach- just fill in the form below!